Orient Express restaurant on an icy night in December. 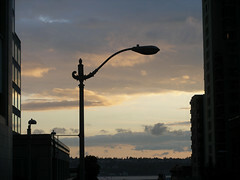 Photo by Wendi. If you eat at Orient Express (the old Andy’s Diner on Fourth Avenue South) on Thursday, February 12, the restaurant will donate 20% of your food bill to the Maple Elementary School PTSA. The money will be used to help fund fourth and fifth grade camp next fall. We reviewed the Orient Express in November, and found the food to be excellent. With the economy the way it is now, this probably isn’t the easiest time to be opening a new restaurant, so by visiting the Express on February 12, you can both help a Beacon Hill elementary school and contribute to a new local restaurant’s success. 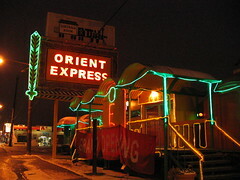 The Orient Express is located at 2963 4th Ave South in Sodo, and they serve Chinese and Thai food in vintage rail cars, including one once used by President Franklin D. Roosevelt. Andy's Diner neon may be gone, but the trains "roll" on as Orient Express. Photo by Buster McLeod. 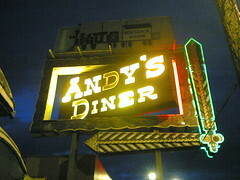 Andy’s Diner, on Fourth Avenue down in Sodo, was one of those places that always seemed like it would be really great. How could it not be, with the colorful, kitschy railroad cars, the old-time steak-and-martini house vibe, and the rumored ghosts? But when we did try the place out, the diner food was edible, not all that impressive, and a little pricey for what it was, so we never got around to going back. When Andy’s closed suddenly early this year, we were sad at losing another piece of Old Seattle atmosphere, but, truthfully, did not miss the food. So it was good news to see that, rather than the teardown or removal to the suburbs that we thought would be in the old railcars’ future, that a new restaurant has moved in — an Asian restaurant called (of course) Orient Express. We checked out the Express recently, expecting possibly OK food, and fearing that the charm of the interior might have been remodeled away. The food, however, is a different thing entirely. The menu is both Thai and Chinese; not as huge a menu as some, but there are plenty of options to choose from. In our first visit with a group of four, we started the meal with Summer Rolls with Peanut Sauce and Crab Cheese Wontons. The rolls were delightful, with fresh vegetables. The peanut sauce was overly mild for my taste, but the flavor was otherwise good. The wontons were quite tasty. We continued the meal with a huge bowl of Hot and Sour Soup. Normally this comes with seafood, but one of the guests in our group asked if it could be made without it. This was not a problem, and the soup turned out to be the star attraction of the evening — spicy, but not too much so, and with flavor to spare. We followed this with Orange Chicken, Honey Walnut Prawns, Phad See Yew (with tofu) and Pineapple Fried Rice. I don’t eat chicken, but the poultry eaters at the table reported that the chicken had a wonderful orange flavor, not too garish, but nicely citrusy. The Phad See Yew and Pineapple Fried Rice were excellent, and the Honey Walnut Prawns were a sweetish contrast to the rest of the meal with honey sauce and candied walnuts: delicious. Our group loved the food, and we stuffed ourselves silly. The portions were generous, so we had quite a bit left to take home. On our second visit as a group of two, we started with Tom Ka soup with tofu (five stars of spiciness, out of five). As in our earlier visit, the soup was once again excellent. It was brightly flavorful and very rich — almost buttery rich — and although we had asked for five stars, the spiciness in no way overwhelmed the flavor. The “two-person” bowl was large enough to fill more than four soup bowls. We followed the soup with General Tso’s Chicken which my chicken-eating spouse enjoyed (not garish orange in color as in so many restaurants, it actually looked like real food instead of food coloring), Yellow Curry with tofu which was rich and flavorful, and Pad Priking, which struck the only off-note of the evening, and that only slightly: the beans and spices were good, but the beef was a little bit tough. Despite that minor flaw, the meal was excellent and we will be back. One other small flaw: Diet Cokes there have that awful watery “bar coke” flavor. Avoid them and try the Thai Iced Tea, which is sweet and good. The waitstaff are very friendly and helpful. The prices are quite reasonable, and the restaurant is open relatively late. The menu has photographs of the dishes, and proudly proclaims “No MSG.” Need more info? The restaurant’s website includes menus, photographs, and the history of the restaurant, including the background of Andy’s Diner before the trains became the Orient Express. Happy Hour: 3:00 – 7:00 pm Monday-Friday, 10:30 am – 5:00 pm weekends: 15% off.